Weather has been consistent lately, consistently crazy. Ups and downs in temperature and barometric pressure can either make fish chew or shut down a bite. The high pressure side of the barometer can slow things, but incoming fronts with rapid pressure drops can make fish chew/bite. Perhaps part of that has to do with fish sensing the change and knowing that food sources may be more difficult to find, so they eat and bite at any opportunity. When fronts bring strong winds that build seas, turbidity makes the conditions in the water unclear, making it more difficult for fish to breathe and to find food. Some fronts make for extreme drops in temperature too, slowing down metabolism. Waiting a couple of days or so for water to clear or temperatures to rise can make for better fishing days. The crazy ups and downs and changes are typical of winter fishing here, and understanding these changes and how they affect fish can help you be a more productive angler. Anglers who fished just prior the last cold front reported a mixed bag. 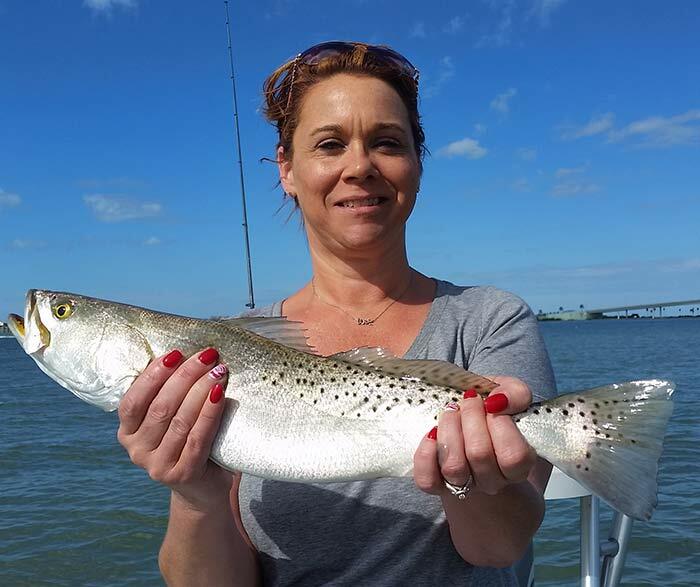 Everything from snook, speckled trout, and redfish to pompano, sheepshead, black drum and silver trout. As the front came thru and temperatures began to fall, the bites and success slowed. That’s pretty much normal for many species. 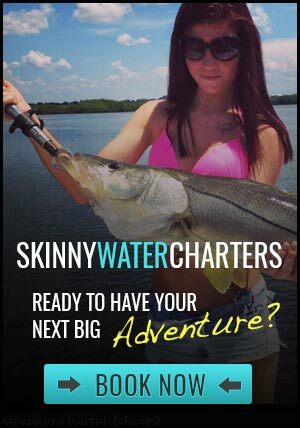 What’s the most consistent fishing to be had, inshore near docks in the Clearwater Pinellas area? Black drum fishing continues to be the most consistent around deeper Docs. Redfish are also around the docks with a few scattered over the grass Flats mixed with big speckled trout. Targeting multiple docks to find where the fish are has been the key to catching fish. What bait / jig should I use to catch the black drums and redfish near the docks? A 1/8 jig head with a shrimp around the docks has been the most productive for the black drum, some sheep head and redfish. Use the mullet schools as an indicator for where to find redfish and big speckled trout. Finding schools of mullet have been tough this year if you find a good school there will be redfish and big speckled trout mixed in with them. Look for mullet to be hanging off of sand bars and oyster bars. 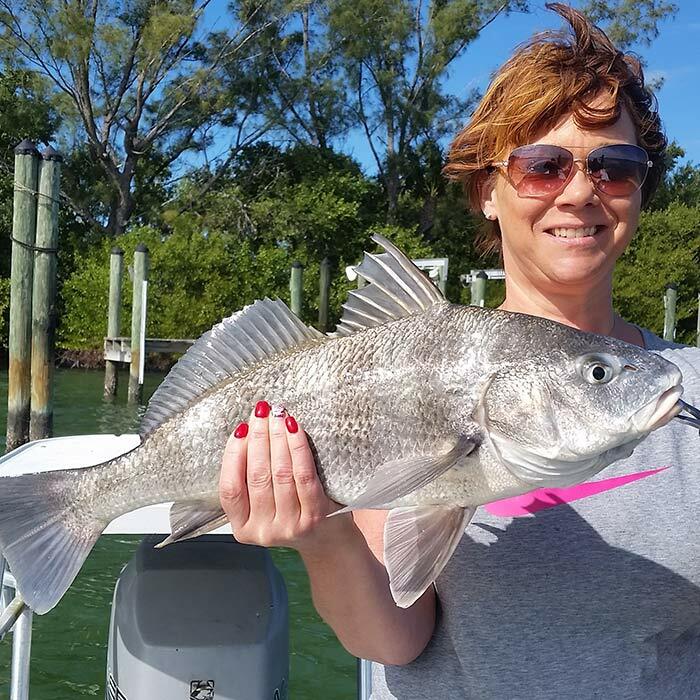 A live shrimp under a popping cork or small grass Grunts and pinfish under a Cajun Thunder well produce a few bites with quality fish. With the recent back-to-back cold fronts look for many species to push deep into the canals or warm water discharges of the power plants.